That's it! 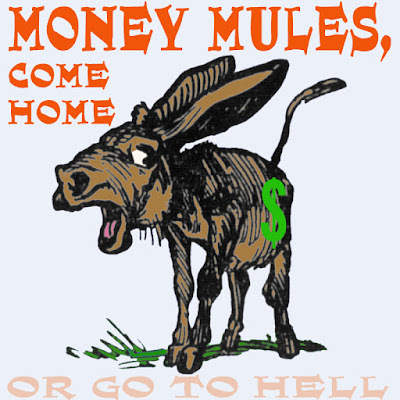 It's the end of May and I'm fed up with my money mules. They ran off with my money and that's it. No more! I'd heard the idea bandied around a few times: "You have money to invest, why settle for a minimal gain in the market or something as volatile as gold, vintage cars, or Pokemon cards? Put your trust in human ingenuity, the creative drive, in short, money mules. Trust them! What's the worst that could happen? They can't be all bad. Load up each mule with $100,000, send them forth, and see how much money they bring back. Give them a small percentage and keep the rest." Still, if they would only come home. At least one, let's say, who could give me a line on the others. I'd love to get my hands on them, to ring their duplicitous little necks, then kick them to the curb, then tar and feather them, and -- you get the idea. Anything but welcome them back with a brotherly kiss. Although, I suppose, if they had a good excuse for their absence, I might listen. Especially if they had a sack of money. It's possible it's all on the up and up. And that my money mules might still be coming home. Maybe they'll show up all innocent, telling me rightfully, "You didn't give us a deadline. We were making so much money we thought we might as well gather up as much as possible for you." I'd love to hear that, but, really, can life work out as fine as that? Surely not. They've surely seen their advantage; they have my money so they've run. But really, what if? It'd be great to think they were really that industrious, and on my behalf! Although it's much more likely they're just scoundrels, profligates. I feel like taking a crowbar... Running it up my sleeve... Or maybe down the leg of my pants... A crowbar on each leg... And finding them. I suddenly find they're in a particular nightclub in Boise, let's say, and I show up, a crowbar down each leg. I'm listening to their conversation, their laughing, their boisterousness in buying each other drinks at my expense, and I make the sudden reveal: "It's me!" Suddenly with crowbars flying like nunchucks, heads colliding, screaming, the whole works. "Cheat me out of my money, will ya?!" Until I get a line on them, frankly what choice do I have but to just forget it? Live and learn. Boise, Helena, Seattle, somewhere up there in that godforsaken country. Let me get my hands on them! Or let me forget the whole thing... It'd be great if just one of them came home, or two. I'd get them separated and grill them. Of course they'd be lying, but I might ferret out some truth by splitting the difference in their stories. Until I get more answers, the whole money mules thing is done.